Born in Sargodha in 1950, Hafiz Saeed lost 36 members of his family while moving from Shimla to Lahore in the course of partition of India. General Ziau’l-Huq made him a member of the Islamic Ideological Council. He was also made professor in Islamic Studies in the Engineering College. In 1980, he went to Saudi Arabia for further studies in Islam. Reports are that in 1980, Usama bin Laden was his colleague in the educational institute in Saudi Arabia. 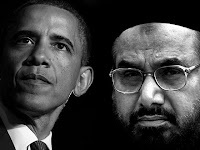 Americans have the grouse that Hafiz Saeed maintained contacts with Osama till latter’s last day. Hafiz Saeed is no more connected to Lashkar-e-Taiyyeba; he is the chief of Jamaatu’d-Dawa. It has about 2500 offices and more than 11 seminaries (darsgah) where higher education is imparted. In an interview given to Geo-News Hafiz Saeed said that “there was no relation between LeT and JD. He also said that no person of LeT was a member of JD”. In a verdict of 12 October 2009, Lahore High Court exonerated him of all charges. This was despite the fact that India had repeatedly brought pressure on Pakistan against him. New Delhi also supplicated before the UN to declare LeT and JD as terrorist organizations. These were declared terrorist organizations by India, USA, UK, European Union, Russian Federation and Australia. Interpol was approach to apprehend him as he was declared most wanted person. Why do India and western powers consider Hafiz Saeed dreadful for them? We should remember the axiom that one man’s terrorist is another man’s hero. An organization believing in armed struggle is considered terrorist organization by the country against which it is active. Bhagat Singh was a terrorist in the eyes of the British colonialists. How do these people make their place in the minds of their people despite opposition by the whole world? There is a reason for that. Organizations that take up arms but keep in mind that they should maintain good relations with the masses of people and be partners in the pain and comfort of the people only those organizations survive the test of time. Mao-zi-Tung said that “an armed fighter is like a fish and the people are his water.” There have been numerous armed struggles in the world but only a few were successful in real sense of the term. Once in Kashmir we had 147 armed organizations. But today only LeT and HM are existent to some extent. LeT is working for the people in numerous aspects like construction of mosques and seminaries, internal and external affairs and educational foundations. It runs schools throughout Pakistan under JD. Higher education institutes are also functioning under its supervision where English, Mathematics, Urdu and Punjabi are taught. The geography of the sub-continent is an important subject of study in these schools and institutions. Students are made fully conversant with the geography of South Asia.JD headquarter is in Mureedke in Pakistan. The above information is available to every person and LeT and JD both get maximum funding from public donations. Shopkeepers, factory owners and contractors give them donations. Many people contribute a certain percentage of their salary to fund these organizations. It is said that crores of rupees come by way of donation from UK and Dubai. Militant organizations fighting in Kashmir in the past were besmeared with allegations of self-aggrandizement and involvement in superficial issues. But there is no such allegation against the LeT. Hafiz Saeed’s popularity is far greater that any big leader in Pakistan. They consider Hafiz Saeed and LeT as the last resort for settling Kashmir issue with India. Stephen Tankel writes in his book Storming the World Stage about LeT as this: “The Army, ISI and Lashkar would sit at the table together to plan attacks and strategy”. It has to be remembered the LeT is not only connected to Afghan Taliban but many Afghans are enrolled in LeT also. The US alleges that LeT joins Taliban in blocking the supply line of NATO. This is the main reason why the US has declared booty on the head of Hafiz Saeed. Reward for Justice (RFJ) department was opened by the US in 1990. Millions of dollars were allocated to be given as prize to persons who worked in different countries of the world to counter such elements as worked against the interests of the US. During the days when General Musharraf was in power, millions of dollars were placed as prize on the head Al Qaeda and Taliban activists. Pakistan government contrived to get many of such people arrested and in this way enormous sums were obtained from RGP funds. General Musharraf has mentioned it in his work In the Line of Fire. He has listed 670 persons wanted by the US and Pakistan handed them over to the America authorities and in this way grabbed enormous amounts as prize on their heads. Ishtiaq Parker of South Africa was nabbed in a Guest House in Islamabad and handed over to the Americans. In 2002 Ramzi Yousuf was given poisonous injection to fulfill the death punishment given to him by the American court. Kansi was convicted to imprisonment for 240 years. Indian government and media are hilarious that prize of ten million dollars meaning fifty crores rupees has been placed on Hafiz Saeed’s head. They think that in the greed of grabbing this huge windfall Hafiz Saeed will be enchained and handed over either to the US or to India. That is not going to happen. The first thing beyond our comprehension is that what need had the US to put a price on the head of a man who is freely moving to all places. He is not hiding somewhere like Tora Bora as Al Qaeda did. Hafiz Saeed is a Pakistani national. The US could have straightaway asked Pakistan to handover Hafiz Saeed to them. Prize is given only when the wanted person is clueless and the government or the administration has no information about him. Isn’t the US creating confusion of sorts by placing a 50 crore rupees prize on his head? Does the US understand that no government in Pakistan can apprehend Hafiz Saeed and hand him over either to the Americans or to the Indians? We have said that he is the most popular leader among all Pakistani leaders. One would like to know whether the US wants to repeat the secret operation against Hafiz Saeed the same way as she did against Osama? We say with fair amount of confidence that neither the US, nor India and nor Pakistan can apprehend Hafiz Saeed and prosecute him in a court of law because Pakistan High Court has exonerated him of all charges. But the danger is that the allurement of prize money may lead to assassination of Hafiz Saeed. Even in that case India will have to gain nothing. The reason is that he is such a committed and patriotic person that before any adversity befalls Pakistan he would prefer to volunteer for arrest. In that case the enmity of LeT, JD and other organizations towards the US and India will increase manifold. Reports are that he has more than two hundred thousand armed LeT trained militants under his control and they are the frontline of Pakistan army. They were the legions who had attacked Kargil. We have said it repeatedly that as long as Kashmir issue is not solved, the danger of extremism will be there. Neither India nor Pakistan is in a position to relinquish claim on Kashmir. If we want South Asia to be safe against extremism and nuclear adventurism, then poverty, disease and ignorance should be wiped out from the region. India and Pakistan have only one option and that is India, Pakistan and Chine should come together and revive the 1947 position of Kashmir and declare it an independent state. Its security should be entrusted to the UN, India, Pakistan and China. Kashmir should be made a buffer between the three powers. Once Kashmir issue is resolved in this way, the terrorist and armed organizations will have no reason to continue their activities and the threat of terrorism will be put an end to.